Designation: Consultant to Minister of Health, Ministry of Health. Citation: Salah M, Elsous A, Aljabaly A, Moalla TA, Masharfa LE, et al. (2018) Palestinian Healthcare System during Emergencies: Facts, Responses and Challenges; A case of Shifa Medical Complex. Sch J Appl Sci Res. Vol: 1, Issu: 8 (46-53). Copyright: © 2018 Salah M, et al. This is an open-access article distributed under the terms of the Creative Commons Attribution License, which permits unrestricted use, distribution, and reproduction in any medium, provided the original author and source are credited. Gaza Strip has been struggled with three consecutive wars during the last six years. The last one was in July, 2014 and lasted for 51 days. The aim of this study was to provide clear and concise picture of the health situations in Al Shifa Medical Complex during the war 2014. We reviewed retrospectively, from 10th September to 10th December, 2014, the available official documents of Ministry of Health (MoH) and Shifa medical complex including: death reports, hospital admissions, ICU admissions, OR admissions and formal correspondences of MoH and Shifa hospital. Microsoft Excel 2013 was used to analyze the quantitative data. This study was approved by Shifa hospital board management. In general, a total of 2145 deaths and 11066 injuries were reported, in which 581 (27%) and 3436 (31%) of deaths and injuries, retrospectively, were children below 14 years. In Shifa medical complex, 38% (4195) and 23% (484) from the total injuries and deaths arrived to hospital. Among wounded cases, 1019 patients admitted to surgical departments, 253 admitted to ICU in which 20% of them have passed away. Among death cases and injuries, 40% and 51% of them retrospectively were females and children below 14 years. Total number of surgeries was 998 in which 83% of them were major, 4% minor and 13% classified burns surgery. Approximately, orthopedic surgeries accounted for 30% of total surgeries followed by 21% for general surgery and 8% vascular. Neonatal mortality rate jumped double to 14.5% compared to previous years. Shifa medical complex faced great difficulties in dealing with great number of injuries from the war due to lack of drugs, medical supplies, equipments, resources and lack of maintenance services. But it has been able to maintain continuity of health services despite constant crises. Emergency, Healthcare system, Response, Casualties, War, Gaza strip. Healthcare system is Palestine is being described as complex and fragmented. The health system faces challenges in providing a wellcoordinated and standardized health services during normal and peace time. Healthcare services are delivered by four providers: The Ministry of Health (MoH), United Nations for Relief and Working Agencies (UNRWA), the private sector and Non-Governmental Organizations (NGO’s). The MoH is the key and main provider. It delivers primary, secondary and some services at tertiary level to all population in general, while UNRWA provides only primary healthcare services to registered refugees. In Gaza Strip (GS), there are 27 hospitals, of which 13 are managed by MoH with total 1500 beds. Among those hospitals, only 3 have the capacity to hold the burden of major traumas and are: Shifa Medical Complex in Gaza city, Nasser Medical Complex and Gaza European hospital in southern governorate of GS. Al Shifa Medical Complex is the largest and biggest public hospital in GS. It is the main trauma hospital and referral center for surgery. It has capacity of 741 beds divides 241 for day care beds and 500 as inpatient beds. The complex comprises three hospitals: Surgery, internal medicine and maternity hospital and beds distributes: 255, 245 and 241 respectively. Total number of operating rooms (OR) is 32, but because of shortage in manpower, three rooms have been closed until solving this problem. Overall number of staff is 1662 including nurses, physicians, paramedics, administrative and others. Nurses account approximately 39% of total staff. Majority of them have diploma followed by bachelor degree. Table 1 presents information about Shifa Medical Complex. Table 1: Distribution of beds, operation rooms, medical staff and qualification of nursing staff in Al Shifa Medical Complex. We reviewed the official hospital and MoH reports. Hospital documents included: admissions sheets, death reports, Intensive Care Units (ICU) admission and discharge sheets and OR admission papers. Variables studied and described were: age, gender, cause of injury, operated surgeries, etc. Review period lasted for 3 months from 10th September 2014 to 10th December, 2014 at Shifa Medical Complex and data was entered and analyzed using Microsoft Excel 2013. This study was approved by Institutional Review Board of Shifa Medical Complex. This study seeks to present a clear and concise picture of the health situations in Al Shifa medical complex & MoH during war 2014 . The study also, estimate the number of martyrs, injures, types of injures, surgeries, burns. And. In addition, the studies discuss the challenges faced Al Shifa medical complex, opportunities and overcoming obstacles and crisis management during the war. a. Lacking of supplies, disposables IV fluid (N/S 0.9%), Polidine, sutures 0.4, 0.3 Nylon, surgical drains and cannulas. b. Lacking of essential drug: 145 different drugs were sorted unavailable, while 80 other drugs were in less than 3 months’ stock (MoH, 2014) . c. Postponed all elective surgeries resulting in elongation of waiting list to 2017.
d. Lab chemicals and instruments can no longer sustain the medical and operational needs. e. Staff and employees have not been paid salaries from March 2014.
f. Severe shortage of energy and fuel to run generators, ambulances and other vehicles. g. Three weeks before Israel’s assault, the MoH in Gaza declared an emergency because they were unable to maintain services under the strict siege and blockage. The MoH declared emergency in evening of 7th July 2014, the date of starting the attack. As a result, the MoH closed the outpatient clinics in its hospitals, cancelled scheduled of elective surgeries and vacations of all employees. Working shifts were adjusted to two or one shift a day, depending on availability of medical staff. The MoH, World Health Organization (WHO) and other international and local partners established an emergency operation room which was responsible for following up the health situation in Gaza. The Ministry requested all assistances, interventions and donations to the Health Sector to be communicated and delivered through the operation room. Total number of registered deaths related war in Gaza Strip was 2145. Details of numbers of deaths occurred during the 51 days’ war are presented and classified based on gender, age and geographical distribution. The presenting data were from official hospitals documents until four days after the end of war and ceasefire. Gender: Total number of deaths registered by MoH was 2145. 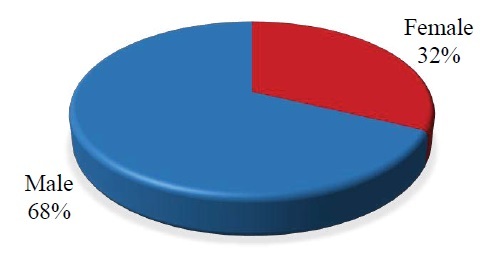 Males constituted majority of them (77%). Figure 1, presents the percentage of deaths in regard to gender (MoH, 2014). Percentage of deaths related war according to gender. Figure 1: Percentage of deaths related war according to gender. Age: As shown in Figure 2, deaths related war in Gaza strip was categorized as follows; children up to 14 years was 581, women aged 18-60 was 263, elderly was 102 (63 Males, 39 Females) while male adult was 1198. Frequency of deaths related war according to age. Figure 2: Frequency of deaths related war according to age. Geographical distribution: Gaza Strip is divided into five governorates. As shown in Figure 3, the geographic distribution of deaths related war showed that 27% (579) of deaths happened in Khan-younis, 24% (504) in Gaza City, 19% (414) in Rafah, 17% (366) in North Gaza, and 13% (282) in Middle-zone (MoH, 2014). Frequency of deaths related war according to area of residence. Figure 3: Frequency of deaths related war according to area of residence. Injuries include mild, severe and critical cases. The total number of registered injuries, according to formal MoH documents, was 11066 cases. Below are further details based on gender and age categories. 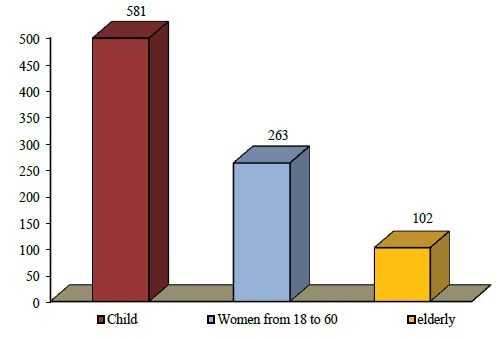 Gender: As shown in Figure 4, males were the majority among registered injuries. About 68% of injuries (7573) were males and 32% of injuries (3493) were females (MoH, 2014). Frequency of injuries by gender. 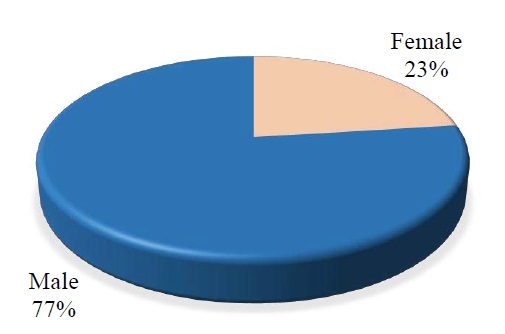 Figure 4: Frequency of injuries by gender. 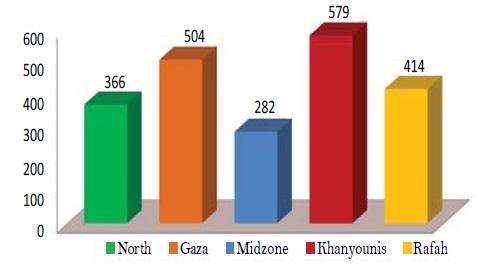 Age: As shown in the Figure 5, injuries in Gaza Strip was categorized as follows; children up to 14 years was 3463, women aged 18-60, was 2112 and elderly was 418, while the injuries from male adult was 5100 cases (MoH, 2014). Distribution of injuries by age. Figure 5: Distribution of injuries by age. The emergency room was responsible for following up the health situation in Shifa medical complex, which included general director of the hospital, medical director, director of nursing and administrative director. To decrease the rate of mortalities through the sustainability of providing people with urgent and essential health services. To enhance the quality and activeness of health and human needs response. To integrate all health service providers’ efforts in order to ensure the participation of available human resources. Preparedness and secure of resources. Effective partnership and unity of efforts among health providers. Flexibility of the activities and delegation of responsibilities. Participation of the society and stakeholders. The developed plan constituted a frame for improving the emergency preparedness; however, still efforts are needed to reinforce the developed plan. The total number of deaths in Al Shifa Medical Complex was 532 while the number of injuries was 5241 (MoH, 2014). 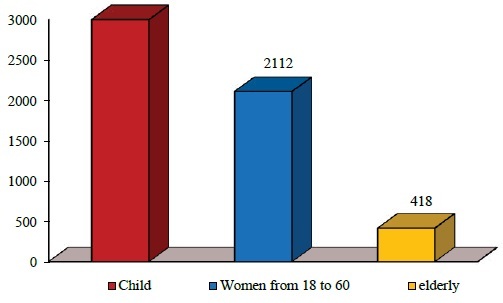 Distribution for number of deaths and injuries were categorized as follows; children up to 14 years, women aged 18-60, and the elderly above 60 years’ group and are presenting in Figure 6. Percentage of deaths and injuries in Shifa medical complex. Figure 6: Percentage of deaths and injuries in Shifa medical complex. Among the 5241 registered injuries, 1549 were surgical cases admitted to surgical hospital enclosing: general surgery, orthopedics burn, neurosurgery, vascular surgery and urosurgery. Moreover, 285 were admitted to ICU department. Figure 7 presents distribution of injuries during the war (MoH, 2014). Distribution of cases at surgical hospital in Al Shifa medical complex. Figure 7: Distribution of cases at surgical hospital in Al Shifa medical complex. Surgical hospital received a very large number of casualties, exceeding the capacity of hospital. As a result, the hospital management responded to the unexpected situation by increasing beds capacity and man power especially among nurses. Table 2, shows that the total inpatient beds in surgical hospital was 165, but during the war the number raised to 215 beds. The extra 50 beds were distributed across hospital rooms. That means each room was fed with extra bed leading to 4 beds in a room has 8 m2. The intensive care unit (ICU) had capacity of 18 beds, but increased to 37 beds. The extra 19 beds were added by taking normal rooms from orthopedic, burns, cardiac and medical departments and turned them to ICU. In addition, the emergency department had capacity of 22 beds (5 triage beds, 3 ICU beds, 2 suture beds, 2 cast beds, and 10 treatment beds), but during the war capacity increased to 42 beds. Moreover, management called for surviving the services and patients through increase manpower. As a result, the ministry fed the hospital with 52 extra nurses, but most of them were volunteers and near graduation nurse students. Table 2: Total Beds at Surgical Hospital in Al Shifa medical complex. The emergency ward is considered small size area. The presence of major and minor cases, limit development of emergency medicine as a specialty, and presence of relatives and friends accompanying the casualties made the work difficult and inappropriate working condition for delivering proper emergency relief and care. Furthermore, the presence of reporters, media teams and onlookers increased the burden of work. During the war, most of hospital beds (741) were used for emergency care. The hospital was struggling to cope with patients referred from other hospitals being harmed or damaged during the war. 30 July, 210 more casualties flooded into the hospital after Israel bombed the market in Al Shujayea during a “humanitarian pause”. At least 150 injuries had to be admitted to Al Shifa, and 60 of them required urgent surgeries in one time. The hospital struggled with fullness of ICU and surgical ward beds. Some surgical cases have been sent to maternity and internal medicine hospitals, and to other hospitals outside Shifa medical complex, themselves already over-stretched. As shown in Figure 8, major surgeries accounted for 83% (866) of total surgeries. 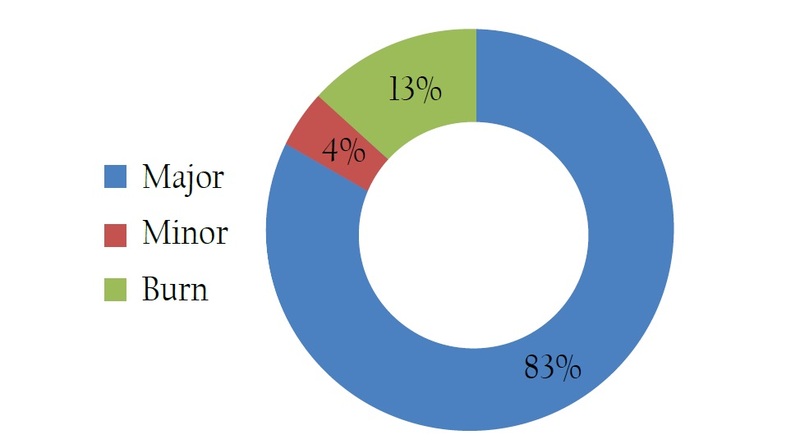 Minor and burns surgeries represented 4% and 13% from total surgeries respectively (MoH, 2014) . Total number of Surgery in Shifa Medical Complex (1051). Figure 8: Total number of Surgery in Shifa Medical Complex (1051). Approximately 30% of surgeries belonged to orthopedics followed by 15% for neurosurgery. Percentages of general and special surgeries are presenting in Figure 9 (MoH, 2014) . Types of surgery in Al Shifa medical complex. Figure 9: Types of surgery in Al Shifa medical complex. Health service delivery: During the war, Shifa Medical Complex was overwhelmed with the influx of injured patients in emergency rooms, surgical wards and operating theatres. Respective medical supplies were in high demand and not always available on time with insufficient quantities. Hospital beds did not suffice; emergency room triage capacity was overwhelmed especially as emergency rooms were overcrowded with family members, onlookers and media. Patients had to be released from hospital prematurely with considerable negative consequences for their healing process. As patient registration and normal administrative procedures collapsed in many cases became very difficult to trace patients and recall them back to Shifa hospital for follow up. Non-war related urgent surgeries such as appendicitis were referred to NGO hospitals in Gaza to decrease the load on the main public hospitals. The NGO hospitals were: Public Aid Society, Al Quds, Al Ahli Hospital and Patient Friends Society hospitals. Also, spare parts were difficult to import and majority of medical equipment were old, overworked and couldn’t be maintained. During the war, there was a considerable backlog of routine health service provision including elective surgeries. In 2013 an average of 5,553 elective surgeries took place every month, up from 4,102 in 2012. Operation rooms: Operation rooms were overcrowded with hundreds of different types of injuries: orthopedic, general surgery, and special surgeries. As a result, operations were performed in corridors and two patients occupied each room. Operation rooms from maternity hospital were also occupied with surgical cases. Human resources (nursing): The severe shortage of nursing workforce and challenge in salary payment prior war impacted the delivery of nursing care. Nurses became exhausted as they had to work extensive hours beyond their capacity and under tough condition. The working hours were adjusted either to 12 or 24 hours on duty to minimize the risk of transportation during air strikes and maximize the availability of staff in the hospital. The total number of nurses in Shifa medical complex was insufficient, the directorate of nursing managed the shortage of staff through emergency schedule by distribution of the staff to three groups each of them work either 12 or 24 hours, qualified nurses were assigned to the emergency department, operation rooms and intensive care units. Also the hospital benefitted from volunteers and internship nurses where they were allocated to non-emergency areas of the hospital. In Shifa Medical Complex, more than 40% of nurses lived in the Mid zone and female employees had more difficulty with the access. The human resource challenges during the war, were: the shortage of specialized nurses, such as intensive care and operating room nurse, securing safe transportation for staff was problematic and nursing staff required capacity building in trauma management. Drugs and supplies: One of the challenges to Al Shifa Medical Complex before and during the war was the availability of drugs and medical supplies. The lack of essential equipment, disposables and lab chemicals created a very serious threat to patient’s health. The hospital consumes usually 40% of MoH drugs and supplies. More than 40% of the essential drug items in the essential drug list and more than 50% of medical consumables were out of stock before the war. These supplies were basic and important for casualties’ management. Some of these were: antibiotics, anticoagulants, antiseptics, and lifesaving medications. During the conflict, emergency drugs have been imported and donated and helped to fill the most crucial gaps at the time of need. Infrastructure: It was the first time, the hospital infrastructures being hit and targeted. The gate, the wall and windows of outpatient clinics and health science library were mildly damaged on July, 28th, 2014. Table 3 presents hospital targeted during the war and severity of damage. Table 3: Hospitals in Gaza damaged and closed during the war 2014. The Shifa hospitals, particularly, was considered safe havens during the war and became shelter for large number of displaced families creating space and hygiene issues overburdening sanitation facilities and other resources. Families of patients had been killed and no one left to care for them. Their homes had been destroyed. They lived in areas under Israeli orders to evacuate and were under threat of being shot if they return. Also, there were often several members of the same family hospitalized, with one in the pediatric ward, one in ICU, another in the orthopedic ward, while other family members camped in the hospital grounds to be near them or because their homes have been destroyed. Al Shifa Medical Complex System is weak and inadequate and suffer from serious problems. Severe shortage of essential drugs and medical supplies. Power supply for generators in Shifa hospital is inadequate. Lack of medical staff security and abuse to human rights. The loss of life due to limitations in providing emergency care and secondary/tertiary care to severe trauma patients. Delay of referring patients abroad, outside Gaza Strip. Premature release of patients from hospitals and limitations in follow up care. Limit access to medicine and treatment. Destruction, damage and closure of health facilities during and after the conflict reducing service availability and straining services in functioning facilities. Extreme shortages of fuel supply for backup generators limits service availability especially at the PHC level. Displacement of hundreds of thousands of people into crowded shelter conditions exposing them to communicable disease. Patients were unable to mount the minimal health service fees and/or the purchase of over the counter drugs in absence of sufficient stocks at health facilities. Many families fell under poverty line because of losing the source of income or increase the financial burden and out of pocket payment. Fragmented health sector with multiple partners, large components depending on long term donor support. The impact and consequences of war exceeded all expectations and contingency plans, were insufficient to manage the challenges imposed on centralized systems and individual health facilities. The deteriorated state of the health system certainly reduced the quality of services provided throughout and after the war. Furthermore, the absence of quality preparedness plans including the preposition of emergency stocks at central level and in each health facility hampered an adequate emergency response. Preparedness plan needs development and strengthening considering lessons identified from the last war. Fund needs to be allocated for the prepositioning of emergency drugs and medical supplies. Health facility infrastructure needs to be reconstructed and rehabilitated as soon as possible, building material and equipment must be imported without delay and restrictions. The reconstruction of facilities need to incorporate the need of people with special needs including safe access for the most vulnerable including women and children, people with disabilities and the elderly. The multiple shortfalls regarding staff needs (salaries, training level, emergency response capacity…) must be addressed as an urgent priority to improve the quality of health services in general and strengthen staff capacity in emergency situations. The authors would like to thank hospital board management and staff for facilitating this work.